Hula Hooping Mom: Happy Birthday Snoopy! Please join the global celebration of our beloved beagle’s birthday by wishing him a big #HappyBirthdaySnoopy on your favorite social channel. My mom loved Snoopy and was a collector. This is one beagle that has always been a part of our family! 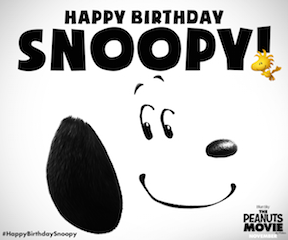 PS – Please be sure to use #HappyBirthdaySnoopy when you share today - we want to make sure Snoopy can find it, and he may even reply to you! On August 10, 1968 Charlie Brown and Lucy surprised Snoopy with a birthday cake! See the comic strip here.